WordPress provides incredible support for you to work with form submissions in your application. Whether you add a form in the admin or public facing areas, the built-in mechanism with the admin-post and admin-ajax scripts will allow you to handle your form requests efficiently. 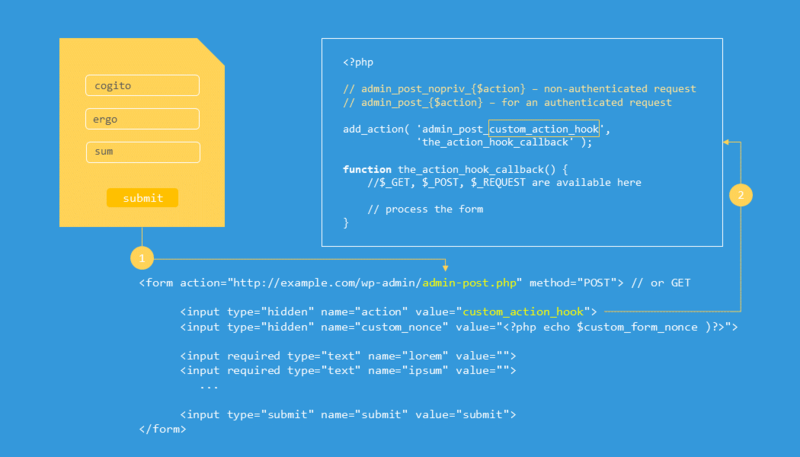 In this article, I’ll show you how to handle custom form submissions using the WordPress API. I’ll walk you through the process of adding a custom form in the admin area of a plugin, handle the form submission via an HTML as well as an AJAX request, and write the form handler in PHP to validate, sanitize and process the form input. While I’ll stay within the admin realms of WordPress, the same concepts are applicable while working with forms in the public facing areas. I’ll also be making use of object-oriented programming constructs for the plugin; however, you can achieve the same result using procedural code as well. The practice plugin can be downloaded from here to follow along with the article. 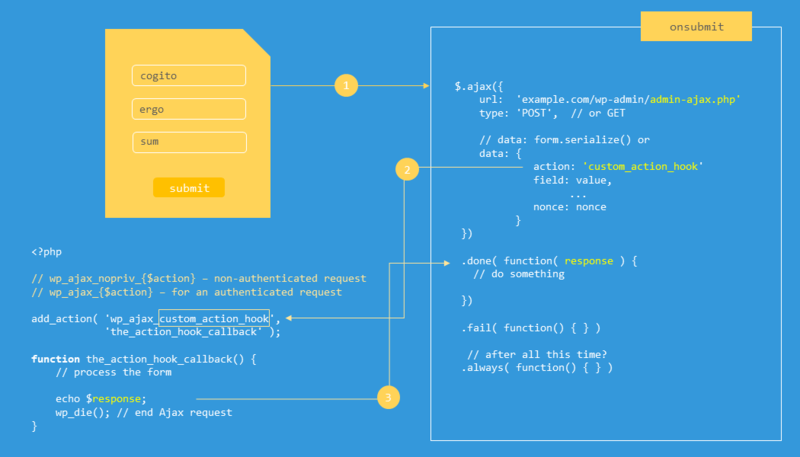 Let’s get started by first understanding the built-in WordPress mechanism to handle a regular form post request. The gamut of hooks available in WordPress gives you great control over the flow of execution of your application. This is no different when it comes to processing forms. All you need is the correct hook to ‘hook into’ and add the custom form handler. The hooks for processing custom forms are dynamic in nature, meaning that the name of the hook partly depends on you. Where $action is the name of the action that was passed through the form. You can then use add_action to tie the PHP form handler to the triggered hooks, where you will have full control to process the form data with the $_GET and $_POST variables. As you may have guessed already, despite its name, admin-post.php can handle POST and GET requests as well as requests for admin and non-admin areas of the application. Let’s explore this with the help of a custom plugin. My goal here is to help you understand everything that goes behind processing custom forms in WordPress with and without AJAX. For this article, I’ve prepared a custom plugin that you can download from here to follow along. I recommend that you have it open in a suitable editor and install it on a local WordPress setup only. I built the plugin using object-oriented programming practices with the help of a plugin boilerplate. Boilerplate Starting Points are among the many best practices listed in the WordPress Plugin Handbook. They’re a great way to ensure consistency across your plugins, and save you a lot of time writing standard code. Over a period, you may even end up writing your own custom boilerplate based on your coding preferences. That’s what I did. The plugin is based on my own plugin template which is a fork of the original WordPress Plugin Boilerplate project. It’s similar to the original project in many aspects but also has support for namespaces and autoloading. This way I don’t need to have unique prefixes for every class or function, and don’t end up with a lot of include and require statements. However, the minimum required PHP version for my plugin is 5.6.0. Note: If you don’t use namespaces or use procedural code you must prefix everything. The plugin has a top-level admin menu with two menu items for the form pages. To see how I added the admin menu pages, take a look at the define_admin_hooks() method in inc/core/class-init.php and the add_plugin_admin_menu() method in the inc/admin/class-admin.php of the plugin. If you’d like to know more about adding admin pages to your plugin, have a look at our article about creating WordPress admin pages here. When I added the “HTML Form Submit” menu page for the plugin, I had to also specify the callback to load the page content. This is where the form is added. This is purely a coding preference. It allows me to keep my code readable by separating the HTML, and makes no difference to the output of the form on the plugin page. The most important thing to keep in mind when dealing with forms in the admin area of WordPress is security. Secure your form using a combination of both WordPress Nonces and current_user_can( $capability ). In my example, I’ve restricted entry to the form with if( current_user_can( 'edit_users' ) ), i.e. the form will be loaded only if the logged in user has the edit_users capability. I also generated a custom nonce by using wp_create_nonce() and then added it as a hidden form field. You can instead use wp_nonce_field() to add it directly. Here’s a great article to understand Nonces in detail. The form submission is made to the admin-post.php using the admin_url( 'admin-post.php' ) function rather than hardcoding the URL. When WordPress receives the form, it will look for the value of the action field to trigger the form hooks. In my case, it will generate the admin_post_nds_form_response hook. Had it been a page open to the public view, it would have triggered the admin_post_nopriv_nds_form_response hook. the_form_response() is where I’ll have full access to the form data via the $_POST or $_GET superglobals. As shown below, I added a breakpoint to the callback in my IDE to be certain that the hook would work as expected. Before performing any operations, you must validate the nonce and sanitize the user input properly. 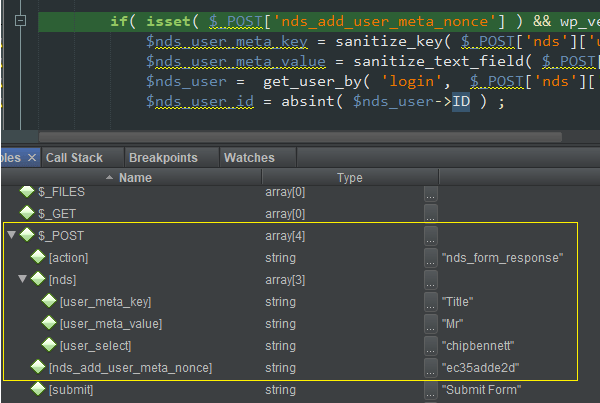 I made use of the wp_verify_nonce( $nonce_name, $nonce_action ) function to verify the nonce, and sanitize_key() and sanitize_text_field() functions to sanitize the user input available in the $_POST variable. 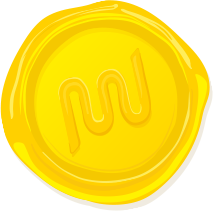 If the nonce verification fails, the user will get an error message as the server response, using the wp_die() WordPress function. Note: I accessed the form data using the $_POST variable. Had I submitted the form using the get method, I would instead make use of the $_GET or $_REQUEST global variable. Only when I’m sure that everything is in order, would I perform a WordPress operation like adding the user-meta to the selected user. To know more about input sanitization, I recommend that you read through the WordPress Codex: Validating Sanitizing and Escaping User Data here. After performing the server operations, it’s important to send the server response back to the user. To do this, you will first need to redirect the user back to an admin page or one that provides some feedback. I redirected the user back to the plugin page and used WordPress admin notices to display the server feedback. 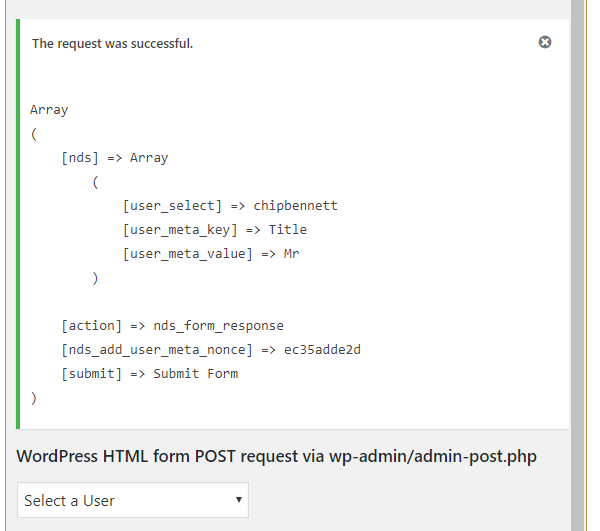 The server response in my example simply outputs the $_POST variable as a WordPress admin notice. At this stage, I have a fully functional form in the admin area of my WordPress plugin. It’s secure and submits properly to my form handler, where the input data is sanitized and finally, the server response is visible. The form will work out of the box in all browsers that have support for HTML5. But there’s a lot I can do to improve the user experience such as adding AJAX support. This approach of establishing a basic level of user experience that’s available in all browsers, and then adding advanced functionality for browsers that support it is called Progressive Enhancement. Note: I’ve made the assumption that my users use modern browsers with HTML5 support. However, if the form had to be rendered on an older browser, the built-in HTML5 input validation for required fields would break. Can I Use is a great website that you can use to compare web features that are available across browsers and browser versions. Where $action is the name of the action that was passed. event.preventDefault(); is what actually prevents the normal form submission. I gathered the form data using jQuery’s serialize() function but there are many other ways to do this. One of them is using HTML5’s FormData interface. It’s beyond the scope of this article but it’s definitely worth looking at. I also added additional URL parameters to the serialized data, so I can distinguish between an AJAX and a regular request in the PHP form handler later. Typically, the X-Requested-With HTTP header is automatically set to XMLHttpRequest by the AJAX library. This can also be used to identify an AJAX request but it’s not always reliable. The ajax() method of jQuery will submit the request to the server. To get the form to submit to admin-ajax.php, I used an array params.ajaxurl that was passed in from PHP using wp_localize_script. 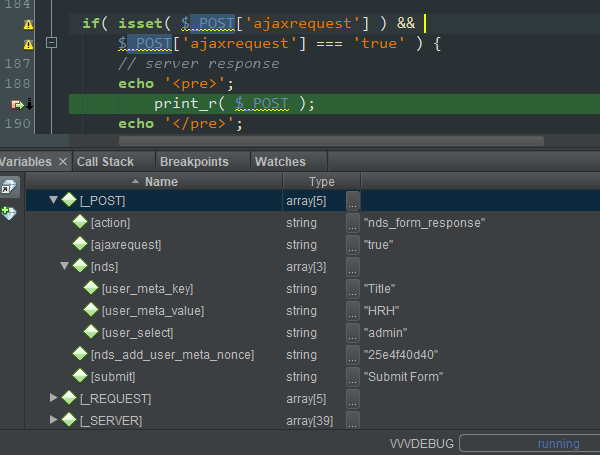 Depending on the response from the server, the AJAX promise callbacks .done() and .fail() will execute accordingly. In my example, for a successful request, I’ve added the response to the empty div container #nds_form_feedback that was part of my form HTML. Finally, the fields are cleared by reseting the form. I’ve attached the same form handler the_form_response to the AJAX request as well. That’s it. With AJAX, the response is displayed without the page being reloaded or redirected. You can certainly do a lot more to improve the user experience, and I recommend you read through the jQuery API documentation for AJAX here. Do you use custom forms on your site? Let us know in the comments below. Great tutorial. What did you use for the Diagram? Skip if it is Photoshop.